Submitted by admin on Tue, 03/15/2016 - 09:33. The Canadian Association of Computer Science/Association informatique Canadienne is pleased to announce the winners of the Outstanding Young Canadian Computer Science Researcher Prize for 2015. 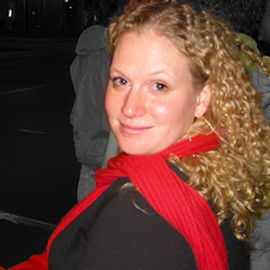 Kate Larson’s research is in multi-agent systems, a subfield of artificial intelligence that brings together computer science, mathematics, and economics. 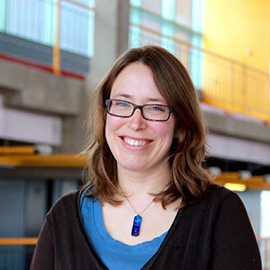 Kate is an outstanding researcher and in recognition of this Kate recently was awarded a prestigious Province of Ontario Early Researcher Award. To get a flavor of her research, consider the following (the work was done in collaboration with Georgia Kastidou and Robin Cohen). In e-commerce and online communities such as Amazon.com and TripAdvisor.com, a very useful feature is the ratings and recommendations of other participants. Over time, participants build up reputations within an online community for being more or less reliable. But a problem is that a reputation for reliability or usefulness in one community, such as Amazon.com, cannot be transferred to another community, such as TripAdvisor.com. Kate’s research addresses this problem by proposing a framework so that communities can exchange reputation information. A notable property of the framework is that honesty really is the best policy in this framework. Using Kate’s proposed framework, each online community is strengthened and benefited and individual participants themselves have an incentive to be better community citizens. Kate is also remarkable for her service orientation and her commitment to giving back to her community. Of particular note are her positions of leadership in the scientific community—she is currently president of IFAAMAS, the community of multi-agent researchers, and a Councilor for AAAI, the association of artificial intelligence researchers—and her work on outreach. In outreach, Kate has been active in organizing and speaking at events for female high school and university students to help ensure that young women see computer science as a career option. In summary, Kate combines excellence as a researcher with leadership in the scientific community and a commitment to the wider discipline of computer science. Dr. Zongpeng Li is a world-leading expert in Network Coding, which is a relatively recent innovation (about 15 years old) in theoretical networking research. Network coding combines ideas from Information Theory with those from Computer Science and Computer Networks. A primary focus is on determining the maximum possible throughput that is possible for information flows across general data networks. Unlike current networks, where nodes simply forward data packets passively towards their destination, network coding allows data flows to be actively sliced, diced, and mixed at arbitrary nodes within the network. With proper design, this approach can exploit multiple parallel data pathways to increase the end-to-end information-carrying capacity of the network. 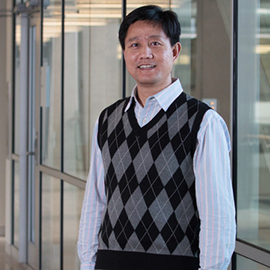 Zongpeng has contributed enormously to the theoretical underpinnings of network coding research, including fundamental results that highlight both its strengths and limitations. His work has broad applicability to the design of next-generation information networks, particularly for supporting big data transfers using state-of-the-art communication technologies. Dr. Regan Mandryk is one of Canada’s top researchers in Human-Computer Interaction, particularly in the areas of game research and affective computing. She is an extremely productive scholar with more than 100 publications, and both she and her work have received numerous awards. Dr. Mandryk and her students have made several important contributions to knowledge, all of which have had substantial impact on the research community. For example, Dr. Mandryk developed the first models of emotional response in computer games, which enable games to adapt themselves to the player’s emotional state; she invented new techniques for player balancing that allow people of widely different skill levels to play together in competitive games; and she developed new techniques for persuasive computing that have been applied in a range of systems – from helping people make healthy food choices, to helping children with FASD improve their ability to concentrate. Dr. Mandryk’s research program is innovative and highly collaborative, provides expert training for a large number of students and other highly qualified personnel, and has attracted substantial interest from several industrial partners.